The Message From Crow: “Crow is the protector and the messenger of your unique story in life. When he visits you, he comes to help you move from one life “chapter” to another. He stands at the doorway and asks you what you have learned and why you are ready to begin something new. He asks you what is the purpose of your new journey? What do you really want? Do not be scared. 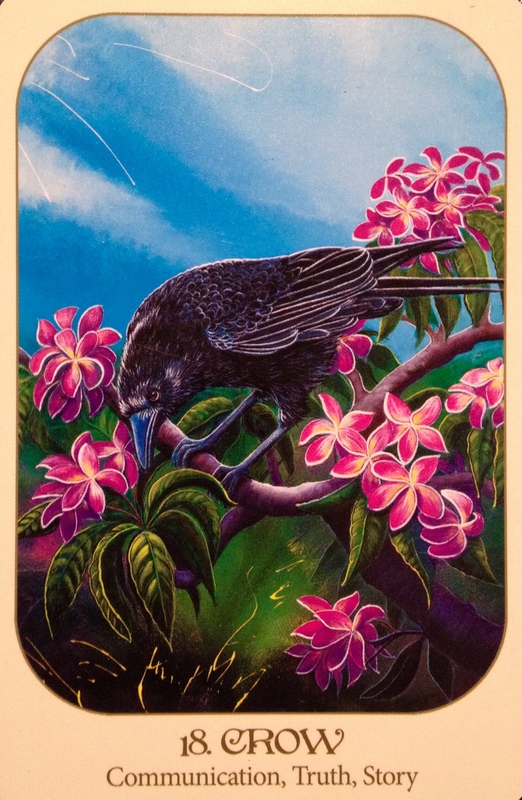 Crow asks you these things with a smile because he knows this is a special time and he has come to help you celebrate what you have achieved so far and to help light the way for what is next! Welcome! We spend so much time chasing carrots. We catch some of the carrots, mostly little ones along the way… sometimes even big ones… and yet we don’t stop to savour the moment of victory… we just keep going, keep chasing, keep pursuing. What we don’t realize is how powerful those moments of enjoying can be. We don’t realize that by celebrating each small victory, we pave the road to more of the same with grace and ease. When we keep going in hot pursuit, we tell the Universe the same message over and over again… this isn’t enough… this isn’t enough… I’m not enough… what I am chasing is still far from me… I must keep going and going and going! Phew! No wonder we are all so exhausted and overwhelmed! Take a moment to communicate with crow. Crow doesn’t miss a thing; Crow sees every little detail, from every angle. Crow never lacks confidence, and crow never misses an opportunity. Crow is crafty and quick thinking; he sees the lesson and moves on. He knows what he wants and is not afraid to go after it. Crow knows his heart and follows it with curiosity and freedom. Learn to appreciate Crow by closely observing him. See him as he sees you. As an equal; a conscious being on this planet, an integral part of the Universe; connected to Spirit just as he is. Ask that he assists you in seeing opportunities coming your way. Ask Crow for definitive answers… to me, a big “caw” from Crow can shed a lot of light on a situation or person I’m wondering about. You decide whether a caw means “yes” or “no” and go from there. Crow will know exactly how to assist you… if you are open and receptive to his assistance.